When it comes to photo prints, Baryta paper is a classic choice for gallery-quality results. 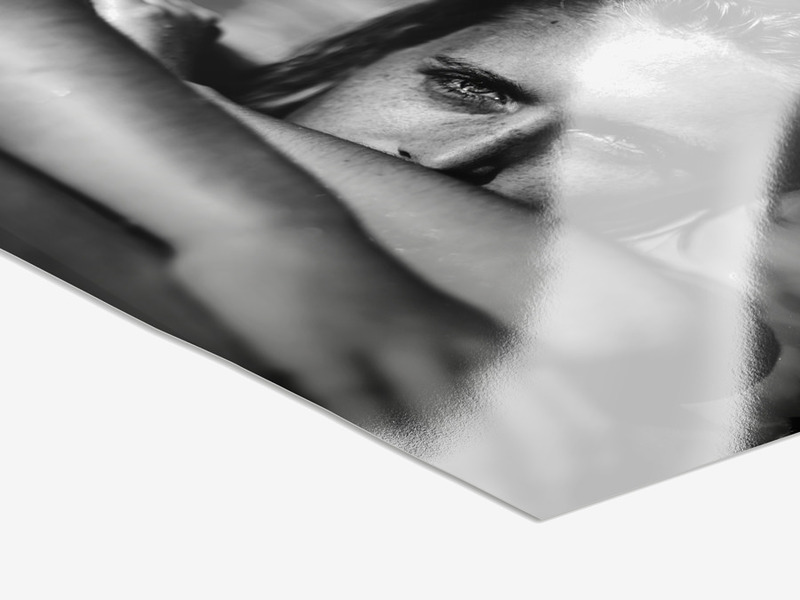 This heavy black-and-white photo paper has a glossy surface – the baryta texture gives it a silky shimmer. With baryta paper, which has been a hit with photography aficionadas for more than 140 years, WhiteWall is taking the success story of black-and-white photography to a new level. 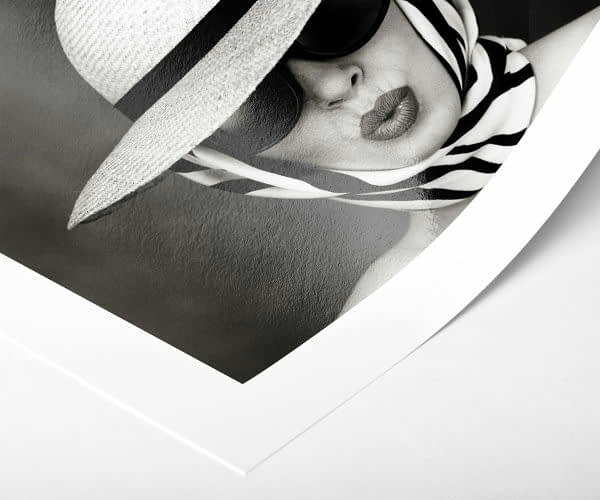 Traditional photo papers are made of a coated polyethylene, which makes processing them easier and quicker. The key difference of baryta paper lies in the barium sulfate (the so-called “baryta”) coating. Ultra-white with a neutral image colour, the paper is outstanding at combining brilliant white with intense black tones. This is also reflected in the high D-max value of up to 2.3. The shades of grey are nuanced, the contours extremely sharp. Thanks to the natural brilliance of the baryta coating, optical brighteners or laminations are no longer needed. This increases the silky paper's longevity by several decades and makes it the most durable photo paper in the world. At 315g/m², the paper is very heavy and stable. Due to the elaborate developing and rinsing process, the baryta paper will not exactly conform to millimeter-exact measurements. The special developing process at the WhiteWall photo lab turns your artistic black-and-white photographs into high-end baryta prints. First, the cutting-edge LightJet laser exposes your image onto the photo paper. This is followed by traditional silver halide developing, fixing and washing. Although the final wet phase precludes millimeter-exact formats, the baryta paper offers so much more: a highly-sensitive panchromatic emulsion, which enhances the picture quality of black-and-white photos to the highest degree - even when they originate from digital image files, meaning you can benefit from the latest photo editing options! At the end of the development process, the chemicals are washed for a particularly long time. Upon request, we will also produce your high-quality baryta print with a white border. In the grand style of vintage photographs, it lends your black-and-white photo additional character and aesthetic refinement. Professional photographers use this border for a practical reason: With the border, the LightJet print on Ilford baryta paper can be inserted perfectly into a passe-partout. No part of your image is lost. In the maximum size, we can only produce your print without a white border. At WhiteWall, you can choose formats ranging from mini to extra-large for your Photo Print on Ilford Baryta Paper. We offer standard formats with different corner options as well as special panoramic, round, and square formats. Brilliant white, the deepest black, ultra-fine tone gradation and sharp contours – when expertly processed, true Baryta photo prints offer unmatched colour intensity and sophisticated elegance. Considered to be the most durable of all photo papers, Baryta is the professional choice for fine art prints by galleries, museums, and private collectors. First developed in 1866, Baryta photo paper is an absolute classic among photo papers. The name “Baryta” comes from the layer of barium sulfate used as a paper brightener for the brilliant white colour. The brightening process occurs before the photograph is developed; meaning the print tone of a Baryta print depends on how effectively the paper was brightened and also on what kind of barium sulfate was used. Baryta photo paper combines rich white-and-black tones in a way that makes contours particularly detailed. Thanks to its natural brilliance, neither brightening nor lamination is necessary — the slightly textured surface will not lose its luster, even after many years. Also, its sturdy nature adds weight and support. In the grand style of vintage photographs, Baryta lends a black-and-white photo additional character and aesthetic refinement. For a personal accent, the final prints can be customised with a white border, a Solid Wood Frame With Passe-Partout, or other variations of Framed Prints. Professional photographers use the border for a practical reason: With the border, the LightJet print on Ilford Baryta paper can be inserted perfectly into a passe-partout. No part of the image is lost. The traditional developing process for Baryta photo paper is very labor-intensive. Unlike papers with synthetic coating, it doesn’t have polyethylene layer. The chemicals can soak into the paper and have to be washed out. That’s not the case for polyethylene papers, where the chemicals are simply rinsed off, and the photo is finished. 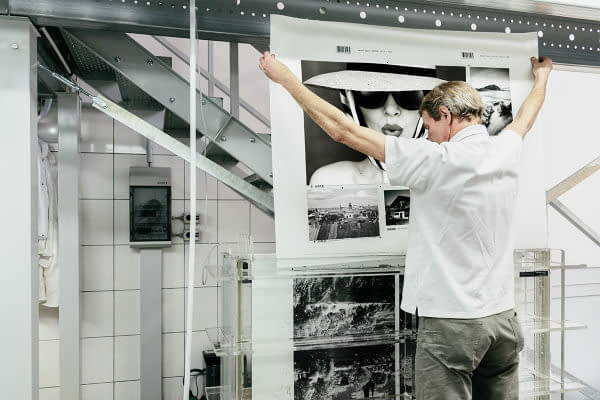 Since every Baryta print is carefully produced by hand, each one is a unique work of art. 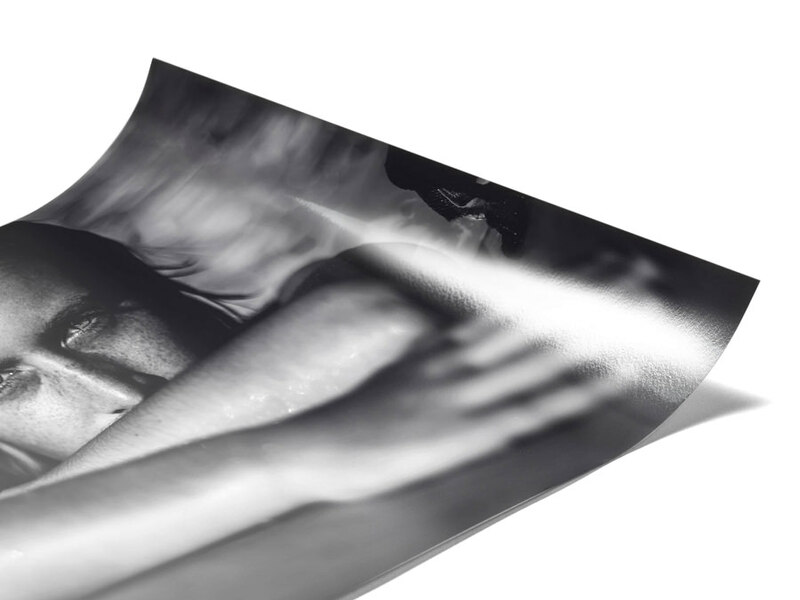 At WhiteWall, the traditional Baryta-coated photo paper is combined with a state-of-the-art, digital laser exposure process resulting in outstanding black & white photographic prints. It all starts with LightJet laser exposing the light-sensitive paper. Next comes the traditional silver halide developing, fixing, and rinsing. Since the chemicals are washed out for a long time, the water and chemicals can soak into the paper, minutely affecting the print’s size. As a result, the print is always extremely individual and emphasizes the photographic handiwork. Additionally, the very sensitive panchromatic emulsion enhances the picture quality of black & white photos – even digital ones – to the highest degree. Alternatively, for upscale, black-and-white prints, you may consider Ilford B/W photo paper. Perfect for portrait photography, it ensures a contrast-rich, expressive picture. Ilford B&W Photo Print comes in glossy or matte options and print size up to 300×48 inches. For colourful photographs, the Fuji Crystal Archive DP II Photo Print is known for luminous, true-to-the-source colors and absolute clarity. The Kodak Pro Endura Photo Print brings distinguishing characteristics to high-end photo prints with luminous highlights, vibrant colors, and an extraordinary tonal range, keeping the image’s colours brilliant for at least 100 years. We recommend the LightJet print on Fuji Crystal Pearl Photo Print paper for contrast-rich images such as nighttime cityscapes with flashing lights. The paper really brings out shining whites and deep blacks, and the surface gloss gives them additional expressive strength. The Fujiflex High Gloss Photo Print makes its mark through an ultra-smooth surface that ensures highly glossy and razor-sharp photo prints. Its warm base tone gives your photographs expressive depth and vibrancy. Your print will shine in brilliant, luxurious color for at least 100 years.